In November 2013, Travefy took 2nd Place in The Kauffman Foundation's National Business Competition (Get in the Ring). Travefy was a named finalist for Silicon Prairie News' annual awards for New Startup of the Year. Columbia University's venture fund (Lang Fund) competition. Columbia was among the contest winners and offered a $50,000 investment. Columbia Business School's Business Pitch Competition held in March 2013. Travefy won 1st Place and a $6,500 prize. Columbia University's Engineering Venture Competition held in April 2013 and sponsored by Wrigley. Travefy won 1st Place and a $15,000 prize. Travefy is the easiest group travel planner. Group travel is complicated. Travefy makes it easy! 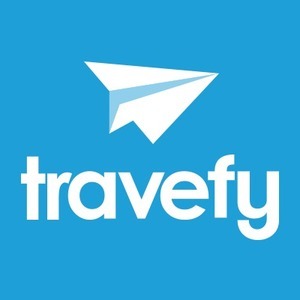 Travefy is a free online group travel planner that solves the coordination headaches of travel. Through Travefy users can collaborate on trip itineraries, book travel deals, and manage shared expenses. Travefy is free to consumers at Travefy.com and offers a white-label "Pro" version for travel agents and vacation providers. Travefy has been featured in The New York Times, Network World, Entrepreneur, and Skift among other publications and has won numerous awards. Travefy consumer revenue is drawn from two distinct sources – booking commissions and expense management fees. Booking Revenue: Travefy Booking revenue is drawn from partnerships with online travel agents like Expedia and Priceline for all travel booked via Travefy. Ease of use and the ability to book travel at the point of decision drive utilization. Travefy has negotiated a variety of agreements across partners, but the standard Travefy share is 5% of the gross value of any hotel booked. Travefy will also be releasing flights in Q1 2014, which earn an average of $1.50 per transaction. Expense Management Fee: For Travefy’s expense management tool, Travefy earns a 1.5% cash management fee for all dollars collected / settled through Travefy. Travefy data further indicates an average expense spend per tool user at $500. In the future Travefy Consumer can also monetize additional sales such as cars, cruises, and tickets. Additionally, rich customer planning, geo-location, price sensitivity and expense data provides future “big data” sales & marketing opportunities. Travefy Pro earns revenue from Travel Agents and Vacation provides in two distinct ways – setup / license fees as well as per transaction fees. Travefy offers two packages for Pro service – Pro and Enterprise – that offer distinct levels of customization and integration. Travefy revenue is drawn from affiliate commissions on travel booked via Travefy. Ease of use and the ability to book travel at the point of decision (when a trip date and location is selected) will drive utilization. Based on average affiliate commissions from our partner – Expedia - the average affiliate revenue per customer is $7.22. Note that a “user” is defined as anyone who uses Travefy as part of trip and a “customer” is a user who purchases travel through Travefy. The Travefy Expense product to be developed during Spring 2013 will earn revenue as a percentage of expenses transacted using the tool. This fee will be 0.50% or a half of a percent of all shared expenses processed. Further, through customer discovery conversations, we estimate this value of shared expenses per user to be $500. Initial data indicates customer willingness to pay a base of $200 per month subscription fee, which would pay for itself (based on avg. $50-$250 commissions per trip) with 4 to 1 new customer per month. Further discussions including new product development like the expense tool show a future willingness to pay up to $500 per month. Given recent trends in online travel, the overall travel space is becoming more & more crowded. Nonetheless, the group travel space remains a rare niche without a market leader. 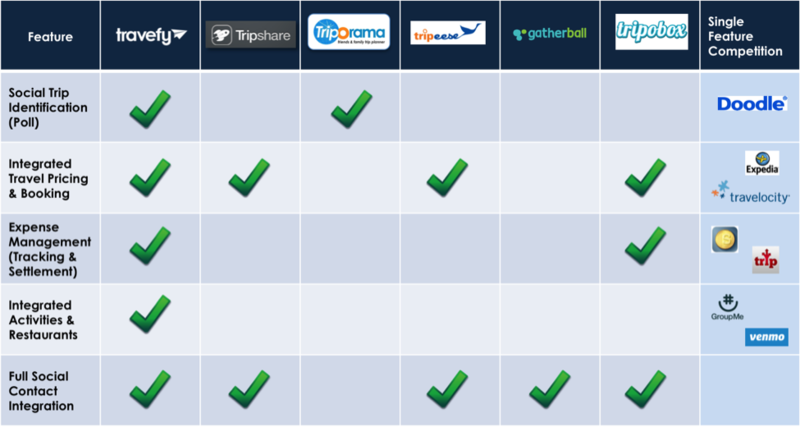 Besides simple legacy tools like TripORama, this has led to the rise in the past 18-months of several launched or to-be launched tools to aid in group travel planning. Among this peer set (seen below) Travefy provides the most comprehensive offering in terms of social integration, social voting, booking tools, and expense management. It should also be noted that single feature competitors such as OTAs on the booking side should not be seen as pure competitors, rather as partners for lead generation. This relationship, as seen by metasearch companies like Kayak, leads to a “buy” vs. “build” mentality. Given the fundamental changes to the travel market and specifically the changes that are affecting Travel Agents, there has been a rise in customer relationship management tools and itinerary development tools. While most are single-facet tools – like Gogobot for activity discovery – only TripIt Pro and TripCase bridge communication and itinerary creation, yet still have significant gaps in functionality that create sizable opportunity for disruption. 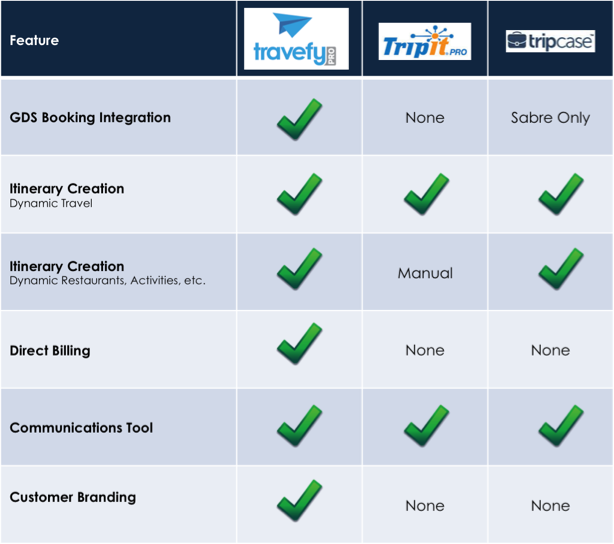 Nonetheless, Travefy Pro is distinct both in its full GDS / booking integration and direct billing, as well as the white-label customer branding provided. (Comparison below). 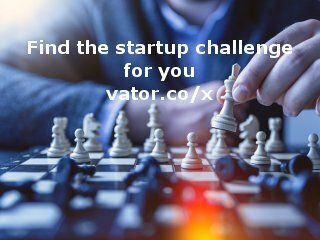 Furthermore, these two competitors – neither of which have market dominance – also display a customer willingness to pay even without booking and billing abilities. Travefy was featured in a VatorNews article: "Funding roundup - week ending 5/1/15"